Evita Studios is an ideal destination for families, couples, solo travellers and large groups of friends. Centrally situated in Svoronata, it offers easy access to many places of interest — but above all it’s the warm and friendly hospitality it offers that draws travellers to Evita Studios. Evita Studios offers comfortable modern facilities. All the studios are modern and designed with attached kitchenette, air conditioning, en suite bathrooms, shower, one double or two single beds, dressing table, TV with satellite, table and chair, and large wardrobes. 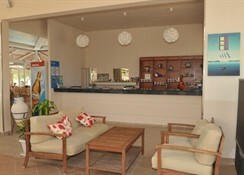 Evita Studios houses a bar that serves a wide collection of alcoholic and non-alcoholic drinks — this is a self-catering unit. It has an outdoor swimming pool and a sun terrace fitted with loungers and parasols — in addition there is a lush garden ideal for kids to play. Located in Svoronata, Evita Studios is a beautiful family run business. 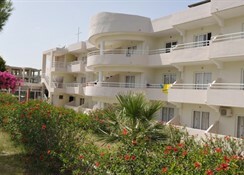 The property is enclosed amidst lush green garden and exotic palm trees. 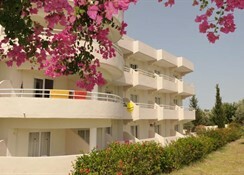 Kefalonia International Airport is about 2000 metres from the premises, while Ammes Beach is approximately 1500 metres. You can also reach Guanacaste within five minutes in a car, and there are lots of restaurants and bars around the corner. 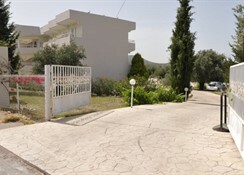 Places of interest around the property are Kefalonia, Makris Gialos and Lourdas. *** Internet is free for guests. A family run buisness with a few staff who where all very friendly and easy to get to know. It's not the RITZ but we didn't expect or pay for the RITZ yet everything was upto a standard that both the wife and I were very happy with. Would suit all but natural born complainers who want more for their money than they deserve. If we visited Rhodes to stay at the same location would make Evita Studios our 'Holiday Home'. Some great eating houses in the town. Upon arrival Mike and Mike (the owners) waited up for us despite it being late. They were really welcoming and helped us with any questions we had. They gave us an idea of what there is to do in Rhodes and also the local places such as restaurants. They even drew us out a map. The room wasn’t quite what we expected but it was just what we needed and what we paid for. On the first day me and my boyfriend had an accident which required hospital attention, and I cannot express how helpful they were and caring. Not only were they hosts but acted like a friend and took us to hospital and waited for us. They made sure to check on us regularly to make sure we were ok and really made us feel comforted despite our injuries. We were unable to use the pool for the duration of our holiday but it was clean and a good size. Breakfast was included in our package and there was enough variety to have something different every day. It was prepared by Mika and Mike or some of the hotel workers and it was brilliant. Above all Mika and Mike were exceptional and really made our stay good despite our accident and we were unable to travel anywhere for the week.